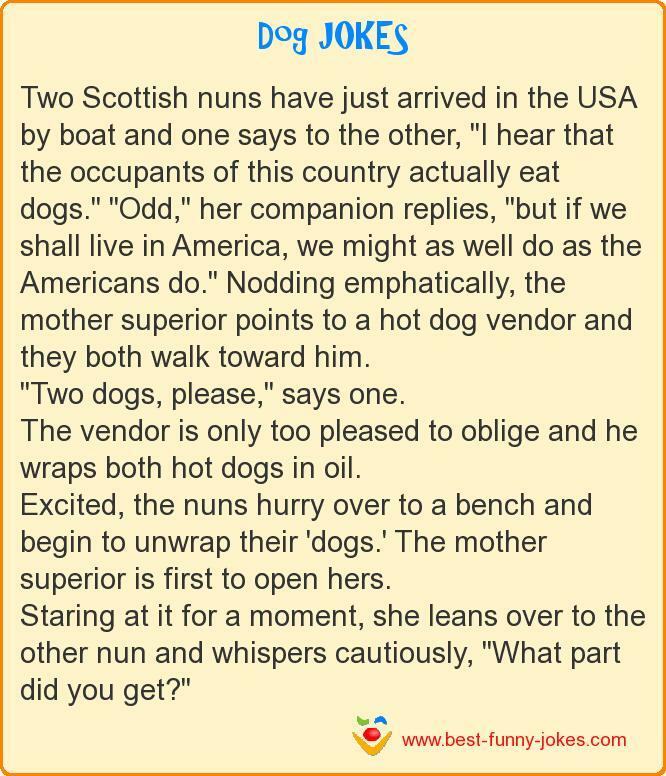 Two Scottish nuns have just arrived in the USA by boat and one says to the other, "I hear that the occupants of this country actually eat dogs." "Odd," her companion replies, "but if we shall live in America, we might as well do as the Americans do." Nodding emphatically, the mother superior points to a hot dog vendor and they both walk toward him. "Two dogs, please," says one. The vendor is only too pleased to oblige and he wraps both hot dogs in oil. Excited, the nuns hurry over to a bench and begin to unwrap their 'dogs.' The mother superior is first to open hers. Staring at it for a moment, she leans over to the other nun and whispers cautiously, "What part did you get?"